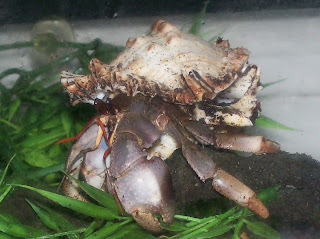 Temperature and humidity gauges are something that all crabbers must have to ensure that their crabitat is both humid and hot enough for their land hermit crabs. However, over time, these gauges will start to get a little inaccurate, which is why it is important to periodically test them for accuracy. There are two main types of gauges that I've seen on the petstore market: digital and analog. The analog guages usually come equipped with a small screw in the back that you can turn to set the humidity or temperature at the right level, but this doesn't work with all of them. Unless you can reprogram your digital gauge, you will have to do the math. To test the accuracy of your temperature gauge, place it in the same spot as your thermostat in your home and see if they read even. If it is too high or low, you know you'll have to turn the dial some by using the screw in the back. You can also do the math. For instance, if it should read 75* and it's reading 65*, you know that it's off by 10 units low, so when reading the gauge in your crabitat, you should add up. To test the humidity gauge, get an air-tight tupperware container with the lid. Place a small amount of damp salt (using a bottle cap works great) in the container and then the humidity gauge. After eight hours (or less if you have a faster-working digital gauge) check the gauge. It should read at exactly 75%. Once again, if yours is off, adjust the screw in the back or do the math. I think everyone should check their gauges at least once every three months to make sure they are working. I don't recommend buying the ones that you have to permanently adhere to the back of your 'tat. Those ones get water logged and then there's nothing you can do about it. Instead, you can hang them from the top of your 'tat or buy ones that stick to Velcro strips. Hi! Thanks for keeping up this blog. 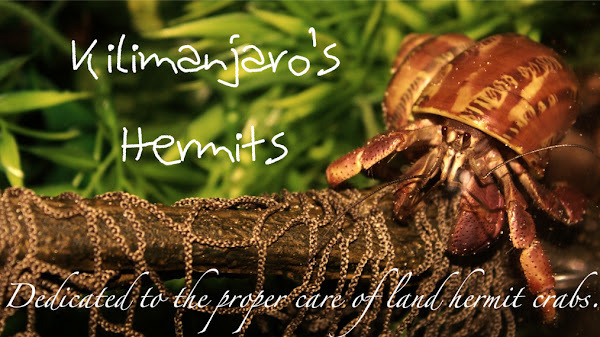 I just found it today and much of the information is very helpful to me, since I just started keeping hermies a little more than a week ago and am constantly realizing how much more I can do for them!